Jos Buttler’s 89 dragged England back into the fifth Test before the home bowlers took control of India on day two at The Oval. Anderson’s two wickets took him to 561 in Test cricket, three away from overtaking Australia’s Glenn McGrath as the most successful fast bowler in the history of the game. What has been so impressive is the way he has adapted his game to suit the circumstances. Here, he was patient, trusting of his lower-order partners and happy to take the runs India offered until the arrival of Anderson signalled some of Buttler’s trademark hitting. India, the world number one side, have lost this series despite having wonderful opportunities to win the first and fourth Tests, both of which eventually went England’s way. 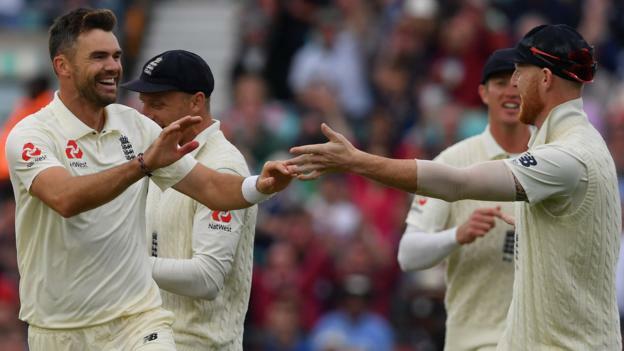 It was another example of how the lower-orders have affected the outcome of this series – England’s partnerships for the fifth, sixth, seventh, eighth and ninth wickets have outperformed India’s. Curran made the breakthrough with a wonderful delivery; one that shaped in and then nipped off the pitch to take Rahul’s off stump. From there, England exploited the gloom and the floodlights. Anderson was immaculate and was only denied an lbw against Kohli when the review showed the tightest ‘umpire’s call’. Anderson’s reaction resulted in words from umpire Kumar Dharmasena. Former England captain Michael Vaughan on TMS: “India had the better of day one, their seamers were outstanding and their intensity was fantastic. BBC cricket correspondent Jonathan Agnew: “Jos Buttler is showing that he can play both types of innings for England down the order. He can dig in and help rebuild or capitalise on a good position.